Making the Case for comprehensive tool tracking. If you’re like most contractors, you’ve invested a lot of money to ensure your teams have the required tools for completing jobs properly. However, despite these large investments in tool assets, you might not be tracking their usage and where they’re located at any given time like you do with your big machinery. Don’t feel discouraged. 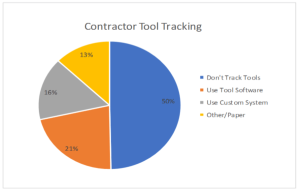 It’s a known fact that construction contractors, and many other industries for that matter, generally don’t track tools. Even though construction companies understand that tracking all of the assets that directly contribute to the completion of a project is important, for some reason managing their large investment in tools is sometimes overlooked. 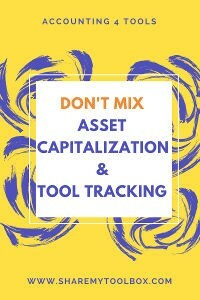 When trying to understand why tool tracking is not a business process for many contractors, you’ll discover that the primary reason lies with their asset capitalization policies. Most CFOs start capitalizing assets at a level that excludes the value of most tools, so tools end up being expensed. On the surface, it makes sense that if tools are expensed, they aren’t listed as fixed assets and are therefore treated as consumables. But the reality is that the lifespan of a tool could be several years or more so perhaps should be accounted for like other pieces of typically more expensive equipment. According to Donna Caruso in Construction Executive in 2015, if it (small tools) can be reused in other jobs, then it may be more properly categorized as a fixed asset rather than a job cost. 41% of all contractors stated that they start capitalizing their tools at $2,500. 85% capitalize starting at $1,000 – a level that still excludes most power tools. 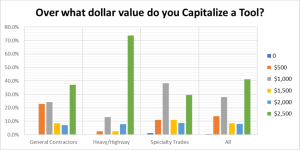 When broken down by type, general contractors were more likely to capitalize at a smaller amount while heavy highway contractors at a larger amount, reflecting what each considers material according to their assets on hand. For example, a heavy highway contractor has a lot of high-dollar heavy equipment, so a $2,000 concrete saw is not worth capitalizing in their operations. It’s clear that with asset thresholds set at $1000 or more, many important tools are not being capitalized as assets. More importantly, when those tools are lost, stolen, or procured for personal use, replacing them can be costly and can drastically slow down a project. A Formula For Trouble – Doing Nothing at All. What are contractors doing today to manage tools and address the tools that are vanishing? It appears very little. To gain an understanding of just how contractors are accounting for their tool assets, the same survey respondents were asked, “How do you track tools that are not capitalized?” 50% said, “We don’t track them at all.” The anecdotal evidence that we’ve attained through our discussions with CFO’s would back up the results that most companies are not doing any sort of tracking of tools that fall below their capitalization limit. Even with tool tracking field applications available for smartphones and tablets, fewer than 5% of contractors are using tool tracking software, and an estimated 75% or more expense tools rather than including them in asset capitalization. Expensing tools once or twice is fine, but expensing them repeatedly as they vanish from the jobsite can truly affect thin profit margins on projects. This is especially important for smaller contractors where every dollar is critical. So, what can really be done to effectively track tools at the enterprise level while still being affordable? We’ve heard numerous times that keeping track of tools on an Excel spreadsheet simply doesn’t work – especially when it comes to accountability regarding who had a certain tool last. Many contractors realize that just having a tool inventory record, doesn’t solve all tool management issues. Fortunately, easy-to-use tool tracking software exists and allows you to manage your inventory from the phone in your pocket. Asset capitalization is a critical part of accounting for construction contractors. But if thousands of dollars are blowing away in the breeze by not accounting for the smaller power tools that continuously vanish from your jobsites, it might be time to consider an easy-to-use tracking system for keeping an eye on those assets that fall below the capitalization threshold.